Who was the head of state reorganization commission? A three-member States Reorganization Commission under the chairmanship of Fazal Ali was formed in 1953. Its other two members were K M Panikkar and H N Kunzru. Who acts as constitutional advisor for Drafting Committee? Who was the Viceroy of India at the time of independence? Which Viceroy served as the longest viceroy of India? Who served as the first and last governor-general of India after independence? Which committee was appointed in 1993 to study creamy layer in OBCs? In which year Nation commission for backward classes was appointed? What are the three words added to the constitution by 42nd Constitutional amendment act? Which article of the constitution deals with Right to Education? This provision was added by the 86th Constitutional Amendment Act of 2002. In pursuance of Article 21A, the Parliament enacted the Right of Children to Free and Compulsory Education (RTE) Act, 2009. What is minimum number of strength fixed for legislative assembly of any state? As per article 170, the Legislative assembly of each state cannot have number of members more than 500 and less than 60. However, there are three exceptions to this viz. Sikkim (32), Goa (40) and Mizoram (40). How many numbers can governor nominate to legislative assembly from Anglo-Indian community? The office of the governor is taken from which constitution? What is the minimum age required to become governor of a state? Who is the chairman of 21st law commission? In which year Union Territory of Delhi was redesignated as the National Capital Territory of Delhi? In 1992, the Union Territory of Delhi was redesignated as the National Capital Territory of Delhi (by the 69th Constitutional Amendment Act, 1991. Which part of the constitution contains Fundamental rights? Which article of the constitution empowers parliament to create a new state from existing state? (e) Alter the name of any state. How President of India elected? Which article deals with GST council? GST bill provides for constitution of a goods and Services Tax (GST) Council by inserting Article 279A in the Constitution. The Council will suggest to the Union and States on the inclusion and exclusion of goods and services. 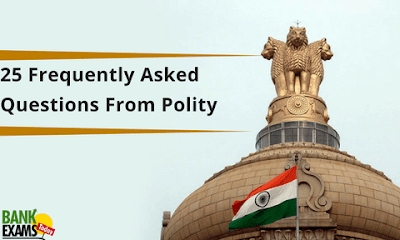 Which article provides for establishment of common high court for two or more states? So far how many times financial emergency declared so far? Which is the only state in India to have Uniform Civil Code? Apart from Delhi, which Union territory has legislative assembly?